It is important to have regular septic pump maintenance checks in Seattle. This will allow your tanks to be in proper working condition. If ever you notice any of the following, it would be best to contact Beacon Plumbing so that our skilled plumbers can fix your septic tank in a timely manner. Slow drainage of the water could mean the pipes have accumulated residue. Bad smells are one of the first signs of any kind of septic pumping problem. First, if you have any of these symptoms it is important to call a professional to handle the job. Septic pumping deals with waste materials which can be hazardous. Beacon Plumbing has the right tools and equipment to protect us while fixing any problems. 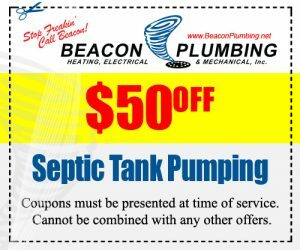 Stop Freakin’ and call Beacon Plumbing for Seattle Septic Pumping. If you suspect any kind of Septic Tank problem then it is time to act fast, and call Beacon Plumbing here in Seattle! The septic system is an indispensable part of a home’s plumbing. It performs the crucial function of carrying all the household waste far away from the home. Even the highest quality septic system will start malfunctioning if it is not maintained properly. Regular septic tank pumping and cleaning by skillful Seattle plumbers is essential to keep the system in order. Call (206) 452-1220 for Seattle Septic tank pumping today. We will inspect your septic tank, the pipes, and pumps to make sure they are all in working order. Our plumbers and technicians know all about the septic system and will make sure your home or business will be safe, and error free. This entry was posted on August 2, 2018 at 2:37 pm and is filed under Septic Pump, Septic Tank Pumping. You can follow any responses to this entry through the RSS 2.0 feed.